Where The Irish-British Peace Process If The Tories Reach For The DUP Orange Card? Further on the crisis in the north-east of the country, presently regional, potentially national and international, Siobhán Fenton in the Independent newspaper reports on fears that the Conservative government in Britain, with its small parliamentary majority, may be looking to pro-union parties here for support in Westminster. The Democratic Unionist Party, with its eight MPs in the House of Commons, is positioning itself as a likely ally for the Tories as they attempt to navigate their way through the difficult aftermath of the Brexit referendum. With the xenophobic Conservative backbenches pushing for the United Kingdom to make a complete break with the European Union, a so-called “hard Brexit”, the DUP is signalling that it may vote with the mainstream of Theresa May’s party in order to facilitate a softer detachment from the EU. Despite the Democratic Unionist leader Arlene Foster and her colleagues favouring a trenchant anti-European policy (the party championed the “Leave” campaign in the Six Counties) the possibility of reciprocal deals with the UK prime minister in the coming months may be of greater importance as the Irish-British peace process begins to go off the rails. As always, the successful playing of the Orange Card in domestic British politics will out-weight any concerns about the impact it could have on Britain’s legacy colony in Ireland. Though, admittedly, the same accusation could be levelled at Micheál Martin, the game-playing leader of Fianna Fáil who has emerged in recent years as the apparent apologist-in-chief for the right-wing political representatives of the British separatist minority on our island nation. Regardless of the circumstances. “Though, admittedly, the same accusation could be levelled at Micheál Martin, the game-playing leader of Fianna Fáil who has emerged in recent years as the apparent apologist-in-chief for the right-wing political representatives of the British separatist minority on our island nation. Regardless of the circumstances.” Yes, his attitude has been far too complacent, far too shaped by perceptions within FF of a political threat from SF rather than the broader dynamics of situation. 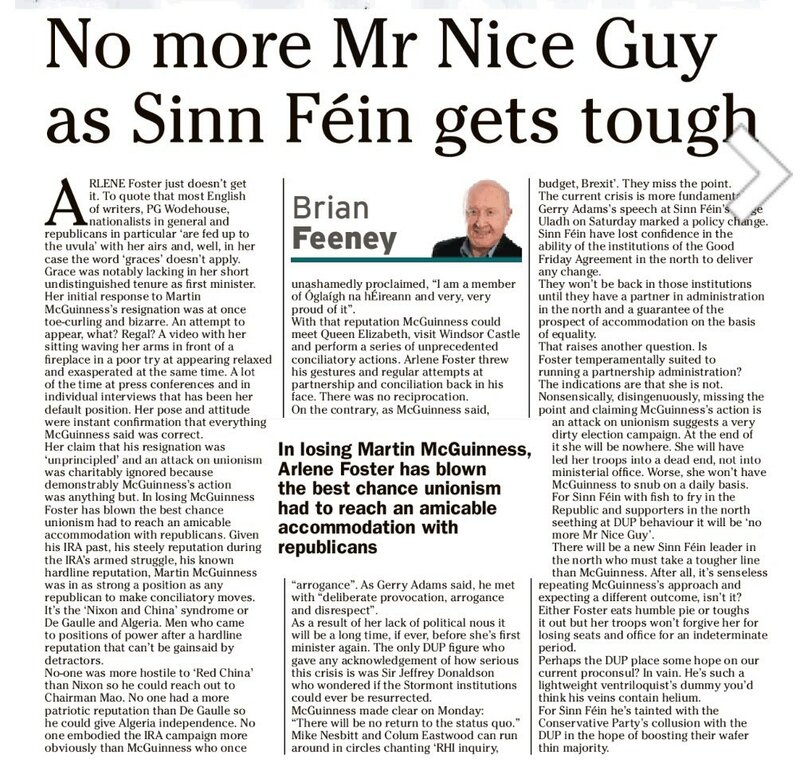 I see Brian Feeney repeating the tired old myths about McGuinness being a hard man and hawk. His proclamation of membership was in court where real republicans remain silent. McGuinness is such a great republican he calls republicans traitors,criminals and terrorists and tells the british police to imprison them. McGuinness is such a hard man he wound up the greatest guerrilla army in the world and delivered it to the enemy. Hopefully this is the last we have seen of him. No problem Phoenix – Unionism is on an irreversible downward trajectory and will be the ELECTORAL minority PERMANENTLY from the mid-2020’s onward in the North. – a minority which will only continue to decrease with every passing year. Unionism has a choice – do business with Nationalists and the representatives that Nationalists choose and implement the GFA in full – or walk away. History shows us that every time Unionism walks away, they do eventually return – but only end up getting an even worse deal for Unionism. Well, how would you refer to the people who carried out the Omagh bombing? Heroes? You sound like a unionist. So do you think that most Catholic/Nationalist people support the dissidents, after all they didn’t support the Provos campaign. So no, I don’t think I sound like a Unionist, I sound like the vast majority of people in the North, whatever their religious or political background, who didn’t support violence during “The Troubles” and want to see an end to nihilistic violence now. Not all “dissidents” (i see you prefer the British media terminology) are involved in violence. Why don’t you tell that to the many men who fought alongside MMG who have believed for many years he is an agent. The Tories are no friends of the Good Friday agreement, I see quasi-direct rule coming back with the DUP in the driving seat as the Tories intend to withdraw from the Human Rights Act , the Good Friday Agreement will be void as one of the central points is the continued adherence to it. The silence from the Irish Government is typical of t FG who are an Irish version of the Tories. That strikes me as a very possible outcome allen fan, a sort of direct rule with some cosmetic trappings to make it seem less so. That would be a disastrous situation. Rather that the garagists running the Tories now see the chance to save a load of money by ditching NI. The next stage after that will be restricted immigration from the EU and dumping the British-Irish common travel area. No, that would give way to Scotland independence, the mindset of imperialism is deep in the Tory psyche and they want to hold what they have…they would have tried to keep Hong Kong only the might of China put paid to that. Writing something not unrelated to this subject at the moment. OK, since this crisis blew open I have been trying to evolve a sensible idea about it, that would eventually advance re-unification, and keep the peace, in the meantime. However, events sweep all before them. We are now, both communities, up the proverbial “Odorous Creek without means of propulsion” There is no realistic solution to the crisis in sight. Anytime now, the “Oirish” regime of FF will be rushing through legislation along the lines of: “Casting of Offensive Substances in to Rotating Machinery Act(Prohibition)2018. In contrast to this, it is, in my humble opinion, as an Irish citizen, that as much stuff should be flying through the fans right now, as can be found. There is no alternative. Somebody has pointed out that BREXIT, thrice cursed BREXIT, will repeal the Human Rights Act, which in turn invalidates the Treaty. That means that a meaningful change had taken place, as the Scots say, and we are entitled to hold a Referendum now on re-unification. We should therefore make it very clear to the Orange head-bangers that the time of their nasty orange ideology is over, for good. That there will be absolutely no compromise to re-open Stormont, unless there are major concessions re the power sharing agreement, genuine respect and equality, etc etc. This is because if they do not do so, the non-Unionists can simply walk out of the Assembly, and it will be explained to them that if this happens, thats it, there will NEVER be a return. This in turn will show that the Nationalists did everything possible to make it work, and put the Unionists on a short leash. They will, of course, blow it, and get dumped, by a walk-out. At that point, I think that the Nationalists can demand from London a unification vote. To add to this, they can also explain the facts of life to the British Government, which is that they risk a breakdown of peace and the resumption of violence, and also that by 2025, Nationalists will have an absolute majority. The same can be explained, to those who endlessly scream “No Surrender”, that now the game is surrender on reasonable terms, or unconditional surrender after 2025. Choose one. It would be a very good idea to debate this. I have a feeling – just a feeling – that the reunification vote is closer than most people think.